Integrated Pest Management (IPM) is a system which uses a combination of all suitable techniques, including environmental manipulation, use of biological control products, host plant resistance and pesticides, to keep pest populations at levels below those causing economic injury. 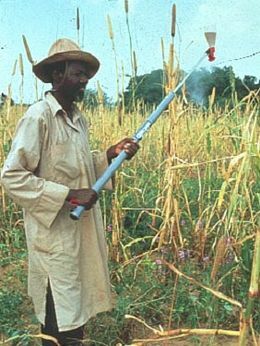 While pesticides are potential tools in any IPM programme they are only used where and when field monitoring of pest levels indicates that other techniques have failed. Within an IPM system it is important, therefore, that farmers have at their disposal safe, effective and efficient methods of applying pesticides which allow them to respond swiftly to pest outbreaks. Inefficient and time consuming pesticide application methods may lead to an inability to respond to pest infestations in time and often result in a regime of unnecessary preventative treatments in order to ensure that the crop is adequately protected. Controlled Droplet Application (CDA), pioneered by Micron, involves the use of rotary atomisers (spinning discs) to generate spray droplets of the optimum size range for the particular pest target. Optimisation of droplet size allows reduced spray volumes to be applied, while maintaining spray coverage, thus giving high work rates and increased productivity. These features, along with the additional benefits of minimised operator and environmental contamination, have important implications in the context of an IPM programme. For most spray applications there are droplet sizes which are most effective in reaching the biological target and achieving the desired biological result. Overlarge droplets are inefficient as they contain a disproportionate amount of valuable pesticide and are likely to bounce or shatter on contact with the foliage, ending up on the ground. Very small droplets are liable to drift and settle outside the target area. The effect of both is the same; the pesticide does not reach the target and contributes to environmental contamination rather than crop protection. Hydraulic pressure nozzles, as used on standard knapsack sprayers, produce a wide range of droplet sizes, containing both over large and over small droplets. Droplets produced using a CDA spinning disc, however, are of a much more uniform size which can be chosen according to the requirements of the specific application - small for insecticides and fungicides to ensure good overall coverage and large for herbicides to minimise any risk of drift onto neighbouring crops. Efficient use of chemicals gives the possibility of dosage reductions avoiding unnecessary contamination of the environment. One of the major benefits of using CDA is to reduce significantly the volume of spray liquid applied to the crop. In the case of Ultra-Low Volume (ULV) spray techniques, special oil-based pesticide formulations are used, undiluted, at total volumes of one to three litres per hectare. With the Very Low Volume (VLV) technique, traditional water-based formulations are diluted and used at total volumes of five to fifty litres per hectare on field crops. This compares with traditional, high volume spraying techniques with knapsack sprayers, using hydraulic pressure nozzles, which require upwards of 100 litres per hectare. Lower volumes mean that spray run off is minimised, thereby keeping chemical on the plant where it is needed and reducing soil and water contamination. A reduction in the need for water is also a great logistical benefit in areas where water is scarce, as is the case in much of the semi-arid tropics. In many cases traditional spray application methods require more time and effort to fetch and carry water to the fields for spraying than is actually spent treating the crop. The greatly reduced water requirements of CDA spraying can thus significantly increase productivity. Where CDA is used for insecticide and fungicide treatments of field crops, with the wind used for spray dispersal (an incremental spray technique), track spacings of up to five metres can be used. This in itself produces a five fold increase in productivity in the spraying process, compared with knapsack sprayers treating one row at a time. With hand held CDA equipment, such as the Micron Ulva +, a hectare can be treated in around an hour, compared with over ten hours often needed to treat the same area using a knapsack sprayer. The capacity to treat relatively large areas in a short space of time is crucial to the use of pesticides within an IPM programme. It allows farmers to respond in a timely and rational manner when pest threshold levels are exceeded, instead of relying on calendar timed preventative treatments which are often unnecessary. It also means that there is the potential to replace aerial application methods in situations where conventional, high volume ground methods would be too time-consuming or laborious. Aerial spraying, best suited to blanket, calendar-timed spraying of large areas, is largely incompatible with IPM programmes as it does not have the same accuracy or flexibility as ground spraying in respect of the ability to treat pest problems only where and when necessary. CDA insecticide and fungicide application (using small droplet for greatest efficiency) generally relies on the wind for droplet dispersal. The trained operator, therefore, always sprays according to the wind direction, walking across the line of the wind, holding the sprayer on the downwind side and working incrementally from the downwind edge of the field. This means that spray is always taken away from the operator, who is walking through unsprayed crop and the risk of contamination is minimised. Additionally, as the amount of mixing and filling required is reduced, there is diminished contamination risk from this process which studies have shown to be possibly the most significant contributor to operator contamination. The decreased time needed to treat fields also reduces the time period during which operators are exposed to pesticides. There is much evidence to show that when applying biological products, such as entomopathogens, bacteria and viruses, which are potentially important elements in any IPM programme, a crucial factor in optimising their performance is good spray coverage which, in turn, is dependent on droplet size. If fungal compounds are formulated in oil suspensions to prevent spore desiccation these are most effectively applied using CDA equipment. CDA has been shown to optimise the performance of many biological products and has been recommended for a variety of such compounds. The improvement of spray application is a crucial step in the introduction of Integrated Pest Management and in many cases this should involve a move towards CDA. 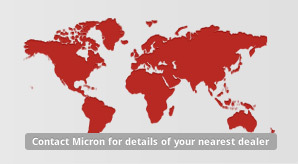 The Micron range of hand-held, spinning disc sprayers provides small-scale farmers with simple, practical and affordable tools for rational and timely chemical and biological intervention only where and when necessary. Good control over droplet size reduces environmental contamination while ensuring the optimisation of pesticide use, thereby giving potential for reduction in pesticide dosage rates. In Egypt, for example, as part of a cotton IPM programme, the introduction of improved ground spray application methods, including the use of Micron ULVAs, has allowed pesticide dose rates to be halved - simply due to the increased efficiency of pesticide application. The availability of effective ground treatment methods has meant that aerial application is being phased out and cotton is treated on a small block basis according to pest levels determined by scouting. This has resulted in an overall delay in the start of pesticide treatment, giving beneficial insects a better chance to get established and an overall reduction in the number of treatments carried out, with a significant increase in yield.